A milk cow freshens after her calf is born. The cow can be freshened one of two ways. The calf can be allowed to suckle the teats of the cow to encourage natural freshening, or the teats of the cow can be milked by hand. The nursing movement of the baby calf's mouth stimulates the cow's udder to drop milk into the teats. Human hands milking these teats, although artificial, will simulate the same movement and encourage the cow to drop her milk. Impregnate a heifer or cow at 18 months of age either by artificial insemination or live bull breeding. Wait nine months for birth of calf. To encourage freshening, provide plenty of water and nutrient-rich feed throughout the pregnancy so the cow is healthy before the calf is born. Have a veterinarian check the position of the calf during the third trimester to ensure the calf is positioned properly for birth. Ask the vet to induce the cow if the due date is missed. Make sure the calf gets to its feet and nurses the mother cow successfully. Push the head of the calf toward the cow's teats if it's having a hard time finding them. Herd the cow into a milking stanchion after the calf has fed. Lock the cow's head into the stanchion and give her some grain and hay. Position a stool on one side of the cow near her teats. Place a clean bucket beneath her udder. Hold the bucket with one hand. Touch the thigh of the cow with the other hand to let her know you are there. Slowly slide your hand onto the cow's udder and grasp one of her four teats. Squeeze the upper portion of the teat between your pointer finger and thumb gently. Pull downward while curling your other three fingers in toward the palm of your hand and squeeze. Repeat this process until milk begins to squirt out of the teat. Milk each teat until no more milk comes out. Talk to the cow while milking to keep her calm. Allow the calf to drink her fill morning and evening before milking out the cow's four teats. Don't let the calf drink too much milk at one time because it will get diarrhea. Continue milking the cow morning and evening until the pinkish or yellowish colostrum milk is replaced by pure white milk. Do this throughout lactation or until a new pregnancy reaches 3-4 months. If the cow is a dairy breed, she will produce too much milk for just one calf. Add another one or two calves if she is a heavy producer. If the cow is a family milk cow, she will produce enough milk for her calf and the family. Milk out the milk for the family first and then let the calf nurse out the rest. If the cow is part of a commercial milking herd, separate the calf from the mother entirely and bottle-feed the calf. 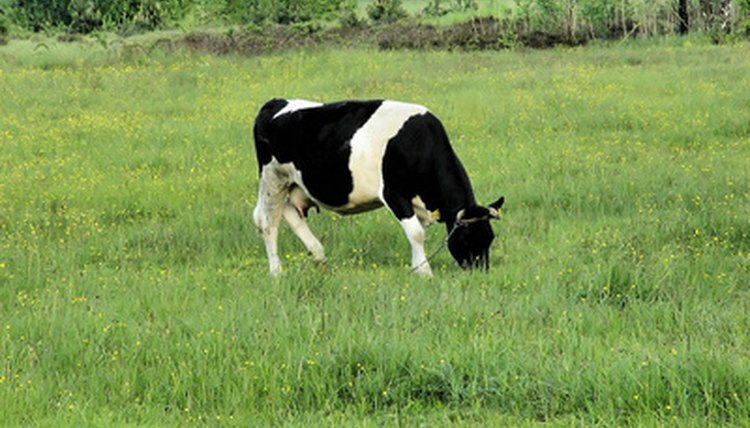 The time it takes to milk a cow varies from cow to cow because of genetic makeup. Do not drink the milk of a cow that was treated with antibiotics.